By most standards, the Massachusetts economy is the envy of many states, a diverse mix of advanced industries driving the strongest growth in more than a decade. But when the impact on residents’ well-being is taken into account, the picture is not so rosy, according to a University of Vermont study to be released Thursday. Using economic, social, and environmental indicators that capture the costs of factors such as income inequality and pollution, researchers found that the state’s economy peaked in 2006, sliding to its worst performance in 14 years in 2012, the last year studied. 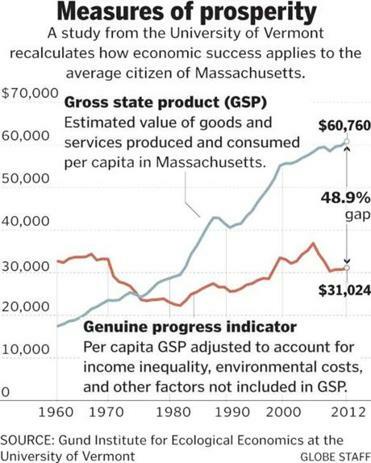 Even though the state’s economy has quadrupled in size over the past 50 years, the well-being of Massachusetts residents has not improved much since the 1960s, the study found. Traditionally, the economy is measured by the value of goods and services it produces, known on the state level as gross state product. The measure used by University of Vermont researchers, called the genuine progress indicator, accounts for the costs and benefits of economic growth, including the gap between rich and poor, greenhouse gas emissions, and the value of volunteer work and higher education. In the aftermath of the last recession, the worst in 70 years, some analysts have questioned whether traditional measures accurately capture economic conditions. The unemployment rate has fallen steadily after peaking at 10 percent in 2009, for example, but many economists note that the labor market is weaker than the official rate shows, since it does not include millions of discouraged Americans who gave up looking for jobs or millions more who were working part time because they can’t find full-time work. The tool used by the University of Vermont — based in part on the work of a Nobel Prize recipient, economist James Tobin — provides a more holistic, balanced picture that shows whether economic growth is actually benefiting people, said Jon Erickson, a professor at the University of Vermont’s Gund Institute for Ecological Economics and lead author of the study. Erickson and his colleagues dug through data from the US Census, the Bureau of Economic Analysis, the Environmental Protection Agency, and numerous other federal and state agencies, dating from 1960 to 2012, to analyze the health of the state’s economy. To determine the impact of running the economy on fossil fuels, for instance, researchers calculated the amount of coal, oil, and other nonrenewable resources consumed each year, estimated what it would cost to replace them with renewable energy alternatives such as wind or solar power, and subtracted that amount from the value of the state’s economic output — treating it as a depreciation cost. When all the additional costs and benefits were accounted for, the researchers found that the state’s economy was $206 billion in 2012 — roughly half the size of the gross state product estimated by the US Department of Commerce. Compared to the rest of the country, Massachusetts is faring well. It has the best economic health among the Northeast states and ranks in the top five nationwide, according to preliminary estimates. Many factors account for that, according to the study, particularly the high educational attainment of Massachusetts residents. Nearly 40 percent of residents held a bachelor’s degree or higher in 2012, the highest rate in the nation. But Massachusetts has still not recovered from the recent recession, according to the study’s criteria, even though employment is at an all-time high following the strongest year of job growth since 2000. Three of the biggest issues holding the state back, according to the study, are fossil fuel dependence, underemployment, and income inequality. The state has one of the largest gaps between rich and poor in the country, a divide that means fewer opportunities for the many who don’t make much money. The top 1 percent of wage earners in Massachusetts have an average income that is nearly 34 times higher than the remaining 99 percent — compared to a 30:1 ratio nationwide. The University of Vermont team has done a preliminary estimate of economic health for all 50 states in 2011, but has not finalized its national data. The State of Vermont conducts a report using the genuine progress indicator every year, and Maryland and Oregon also use the tool. Robert Nakosteen, an economics professor at the University of Massachusetts Amherst, said he supports attempts to capture a broader picture of the economy. But he has a “great dose of skepticism” about the methods used in the University of Vermont study, in large part because it is difficult to quantify factors such as the costs of ozone depletion and lost leisure time. But other analysts say incorporating the costs of growth is more sophisticated and forward-looking than simply tallying up goods and services. “We have a knowledge-based economy [that] is in overdrive and doing well for the well-educated,” said Ira Jackson, dean of the McCormack Graduate School of Policy and Global Studies at the University of Massachusetts Boston. “But if you look under the hood and place equivalent emphasis on the many who are unskilled and left further behind, our Massachusetts economy has the same inequality as Brazil.